Adolph Joseph DeLaGarza (born November 4, 1987) is an American soccer player who plays for Houston Dynamo in Major League Soccer and the Guam national team. DeLaGarza was born in Bryans Road, Maryland to a Mexican-Guamanian father and a Native American mother. At the age of 12, DeLaGarza played for the DC United U-12 at the Danone Cup in France, under coach Dave Sarachan. He also played for Baltimore Casa Mia's Bays, where he won 2 USYSA National Championships. In high school, DeLaGarza played at Henry E. Lackey High School for head coach Gary Lesko in Indian Head, Maryland. DeLaGarza played college soccer at the University of Maryland, College Park. He was named College Soccer News Second Team All-Freshman after helping Maryland win the National Championship in 2005, and was named in the College Cup All-Tournament Team, was a Second Team All-ACC selection, and was his team's Co-Most Valuable Defensive Player as he helped lead Maryland to the 2008 College Cup championship. DeLaGarza was drafted in the second round (19th overall) of the 2009 MLS SuperDraft by Los Angeles Galaxy. He made his professional début on March 22, 2009, in Galaxy's first game of the 2009 MLS season against D.C. United. Following Sean Franklin's mid-season hamstring injury, DeLaGarza played many games at the right side of Galaxy's defense, ultimately clocking 1,754 minutes in his rookie season. 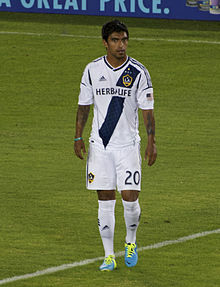 During his first season with the Galaxy, DeLaGarza scored his first goal in a 6–3 loss against F.C. Dallas on September 12, 2009. On October 1, 2012 against Colorado, he went down with a serious injury in the 31st minute. In that match they managed to hold off Colorado in a 1–1 draw. After eight seasons with LA Galaxy, DeLaGarza was traded to Houston Dynamo on January 13, 2017, in exchange for $125,000 of general allocation money and $50,000 of targeted allocation money. DeLaGarza made his Dynamo debut on March 4, the 2017 season opener. He was the Dynamo starting left back as they qualified for the MLS playoffs for the first time in 3 seasons. However, in the final game of the regular season, DeLaGarza suffered a torn ACL, which forced him to miss the playoffs and most of 2018. DeLaGarza returned from injury and made 4 appearances with the Dynamo's USL affiliate, Rio Grande Valley FC before rejoining to the Dynamo to start 4 of the final 5 games of the season. On December 21, 2010 then United States men's national soccer team head coach, Bob Bradley, called in A. J. DeLaGarza along with 23 other players into the United States' January 2011 training camp. The end of the training camp culminated in a match against the Chile national football team. On January 22, 2011, DeLaGarza was selected to the 18 member game day roster. However, DeLaGarza failed to make an appearance in the 1–1 draw against Chile. On January 21, 2012 DeLaGarza made his début for the senior side of the United States in a friendly match against the Venezuela national football team. DeLaGarza started the match and played all 90 minutes in the 1–0 win over the Venezuela. Four days later, DeLaGarza, again started and played the full 90 minutes in the United States' victory against Panama. DeLaGarza was still eligible to play for the Guam national team because he was not officially cap-tied with the United States. On August 27, 2013, he made the commitment to switch and play for the Guam national team. On June 11, 2015 DeLaGarza started and played all 90 minutes in Guam's first-ever World Cup Qualifier win beating Turkmenistan 1–0. Just a few days later DeLaGarza started and played all 90 minutes, against India, in Guam's second ever World Cup Qualifier win. DeLaGarza's son Luca died on September 4, 2014, only a week after being born. Luca suffered from Hypoplastic left heart syndrome, a rare heart defect. In his son's memory DeLaGarza and his family started the Luca Knows Heart foundation to help other people who have the condition. DeLaGarza is married to Megan, his high school sweetheart, and the couple have another child, a daughter, Noelle, born in October 2015. ^ "The MNT Blog". U.S. Soccer. Archived from the original on October 4, 2012. Retrieved October 27, 2012. ^ Salazar, Jo-Ryan (January 16, 2015). "Los Angeles Galaxy at 20: A.J. Delagarza". Fanside. The View From The Avion. Retrieved September 1, 2012. ^ "Galaxt 3-6 Dallas: 13 September 09". September 13, 2009. Retrieved March 21, 2018. ^ "A.J. DeLaGarza". houstondynamo.com. Retrieved November 1, 2018. ^ "Bradley Calls 24 Players to Begin Training Camp on Jan. 4 at The Home Depot Center in Carson, Calif". United Soccer League. December 21, 2010. Retrieved March 21, 2018. ^ "U.S. Men's National Team Opens 2011 With 1–1 Draw Against Chile Behind First Career Goal from Teal Bunbury". United Soccer League. January 22, 2011. Retrieved March 21, 2018. ^ "Ricardo Clark Scores in Stoppage Time as U.S. Men's National Team Defeats Venezuela 1–0 in Opening Match of 2012". United Soccer League. January 22, 2012. Retrieved March 21, 2018. ^ "U.S. Men's National Team Defeats Panama 1–0 for Second Straight Shutout". United Soccer League. January 25, 2012. Retrieved March 21, 2018. ^ Serrano, Adam (August 27, 2013). "LA Galaxy defender A.J. DeLaGarza commits to Guam as he looks to pursue his dream of international soccer". LA Galaxy Insider. Retrieved March 21, 2018. ^ "2018 FIFA World Cup Russia™ - Matches - Guam-Turkmenistan - FIFA.com". FIFA.com. June 11, 2015. Retrieved March 21, 2018. ^ "2018 FIFA World Cup Russia™ - Matches - Guam-India - FIFA.com". FIFA.com. June 16, 2015. Retrieved March 21, 2018. ^ Canales, Andrea (September 3, 2016). "From heartbreak to hope, A.J. DeLaGarza builds the legacy of son Luca". ESPN. Retrieved March 21, 2018. This page was last edited on 4 April 2019, at 21:05 (UTC).